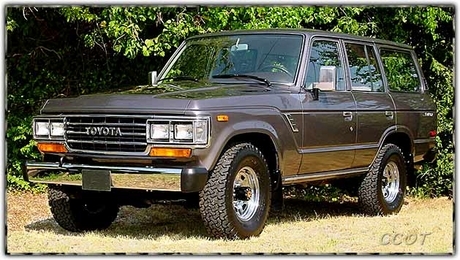 All southern FJ62's that we purchase must be in top original condition with less than 100K miles. Needless to say, we can’t find many - but those we do buy are easily returned to like "NEW CONDITION." Because of our back order on FJ-40's, we can’t spare the manpower nor the time to purchase FJ62's in need of many repairs; therefore, we only buy the hard to find, low mile, Super Clean FJ62s that are most easily returned to like "NEW CONDITION" - and this happens to be exactly what our customers want most. These are the best FJ62s money can buy! The FJ62 Toyota Land Cruiser 4X4 Wagon is equipped with automatic transmission, 4.0 litre fuel injected straight 6 cylinder motor. Standard Equipment: power steering and brakes, air conditioning, rear heater, locking hubs, rear window wiper/washer/defroster, all cloth interior (gray or tan), and reclining bucket seats. Options: power windows/door locks/mirrors, two-tone paint. At CCOT we believe a '93 and '97 FZJ-80 with low miles is TODAY'S best Land Cruiser Values... A "Like New" Low mile FZJ-80 will sell for close to the same money as a Low mile FJ62. This is only a suggestion based on CCOT's experience with today's best Land Cruiser Values and how Tough the FZJ-80 actually is... The FZJ-80 is the vehicle of choice in "Third World Countries". Made it home about 2:00 this morning. She ran fine all the way home, and we had plenty of time to get acquainted, although I'm sure she's in latitude shock at the moment. I have an appointment at the underbody rust proofing place later today. My wife said it looked so pretty maybe we should put it away in storage till spring...I'm headed to the emissions testing place and title bureau tomorrow. Hopefully I have all the documents I need and she does well on the dynamometer based testing cycle. I'll send you a message later on that. All for now, thanks for everything.